Black Walnuts produce a substance known as juglone which is toxic to many plants, and can cause allergic reactions in humans and horses. Juglone is excreted primarily in the roots, saturating the soil in a radius of 50-60 feet or more in a mature tree. The buds and nut hulls are also high in juglone. Juglone occurs in the leaves, bark and wood of black walnuts although to a lesser degree than their roots and hulls. 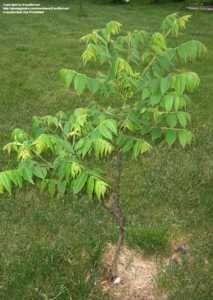 A Black Walnut sapling can spread juglone twice the radius of its small canopy. English Walnut and Carpathian Walnut trees are sometimes grafted onto Black Walnut rootstock (Juglans nigra L.) and Butternut rootstock (Juglans cinerea L.), making those trees produce toxins as well. Because juglone is poorly soluble in water, it tends not to leach out of the soil. Many plants such as tomato, potato, blackberry, blueberry, azalea, mountain laurel, rhododendron, red pine and apple may be injured or killed within one to two months of growth within the root zone of these trees. A few other trees closely related to black walnut produce limited quantities of juglone although toxicity is seldom observed. Those trees are butternut, English walnut, pecan, shagbark and bitternut hickory. The presence of juglone is highly concentrated immediately under the leaf canopy of black walnuts, both from the tree roots and the accumulation of dead and dying debris. Decaying roots from a dead black walnut tree can still contain juglone for many years. 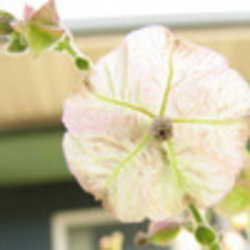 The leaves containing juglone may be composted where the juglone will break down in several weeks from the presence of bacteria, air and water. If you want to test the toxicity of composted walnut leaves, plant tomato seedlings in it. Tomatoes are highly sensitive to juglone and will quickly die in its presence. Fresh sawdust and ground black walnut mulch should not be used around plants sensitive to juglone. Black walnut pollen (usually in May) has caused allergic reactions in humans and horses and black walnut bedding in horse stalls has a similar effect. However, mulch made from walnut bark is said to be safe to use on even juglone-sensitive plants after composting 6 months to a year. Frankly, I’d rather not take the chance. And of course, breakdown is directly affected by soil type, micro-organisms and drainage. Spring is a good time to check your vegetable and flower beds for new seedlings emerging from the nut hoard squirrels may have planted the previous fall. Pulling them out now before their roots take hold is quite easy. There are some benefits to growing black walnuts. One is the delicious nutmeat, and another is the dye you can make from the hulls. 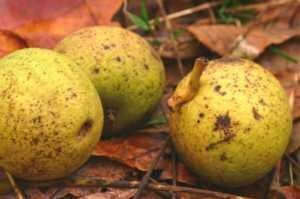 Black walnuts have been recommended for pastures on hillsides in the Ohio Valley and Appalachian mountains to hold the soil and prevent erosion. They provide shade for cattle. There is also said to be a beneficial effect on growing Kentucky bluegrass in pastures. Black Walnut has antifungal; anti-parasitic and antiseptic properties. 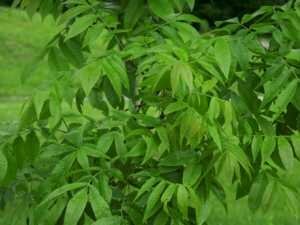 Rubbed on the skin, Black Walnut extract is reputed to be beneficial for eczema, herpes, psoriasis, and skin parasites. External applications have been known to kill ringworm. The Chinese are said to use Black Walnut to kill tapeworms with extremely good success. 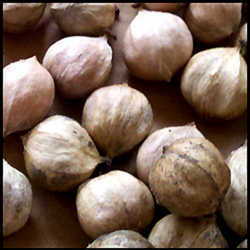 The brown stain found in the green husk of black walnuts contains organic iodine, which has antiseptic and healing properties and also makes a good insect repellant. There are several things a gardener may consider if you have black walnuts on your property. You should locate your garden area as far from the walnuts as possible. If that is not possible, consider raised beds but build them in such a way as to prevent black walnut roots from getting in to the planting area. 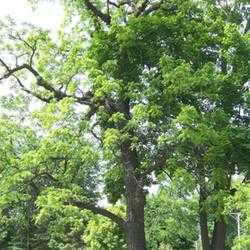 Keep the area clean of all leaves and other debris from the black walnut trees. Black walnuts have a strong, rich, smoky flavor with a hint of wine. Use them any recipe that call for nuts. Caution: the black walnut flavor may overpower everything else. Combine them 1:3 with English walnuts to tone down the flavor. Mix chicken, cheese, onion, flour and 1/2 cup Black Walnuts. Sprinkle into crust. Mix beaten eggs, milk and mustard. Pour over chicken mixture; top with remaining Black Walnuts. Bake at 325 degrees for 50 minutes. 6 servings. Photo Credits: Thanks to hczone6 and Equilibrium for use of their photos from Plantfiles. *Cultivars of some species may survive but will do poorly. Thanks to Ohio State University for their lists of juglone-tolerant and juglone-sensitive plants.